THE mouth organ or harmonica, long a favorite instrument for the old fashioned barn dance and country “hoedown,” has grown increasingly popular, thanks to its extensive use by hillbilly bands. 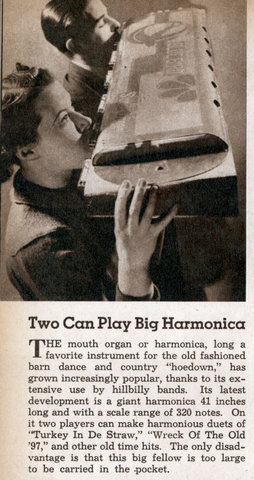 Its latest development is a giant harmonica 41 inches long and with a scale range of 320 notes. On it two players can make harmonious duets of “Turkey In De Straw,” “Wreck Of The Old ’97,” and other old time hits. The only disadvantage is that this big fellow is too large to be carried in the pocket. The heck with it. I’m sticking with my 4-person Kazoo. They could play this 24hrs a day in wash.